VATICAN CITY (CNS) — More than just a good metaphor, the “good shepherd” is a concrete role model for Christian leadership. 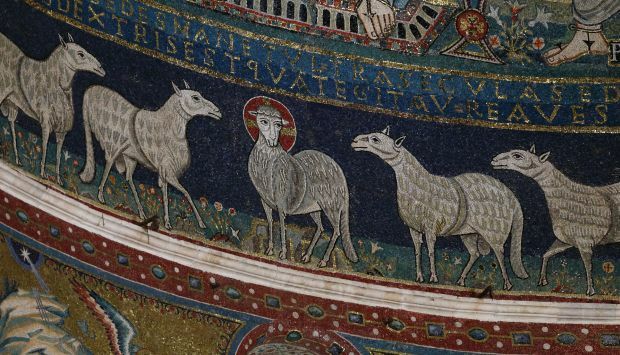 “The fathers of the Bible” — those, like Abraham, Jacob, Isaac, Moses and David — who God chose to lead his people, “are all shepherds of sheep,” in the real sense that they spent years with staff in hand feeding, protecting and caring for wooly ruminants, said Sister Elena Bosetti, a member of the Sisters of Jesus Good Shepherd. Just as Jesus told the fishermen Simon Peter and Andrew to become fishers of men, God transformed his chosen shepherds of sheep in the Old Testament into pastors of people, she said, showing sheep husbandry as a kind of internship program for God’s leaders. Sister Bosetti, a professor and biblical scholar specializing in pastoral symbolism, told Catholic News Service that, unlike the secular logic of power, the Christian model of leadership and authority is rooted in the process of making oneself similar to, not separating or differentiating oneself from, the people to be served. In fact, it takes a real shepherd years of being with the flock every day to gain their trust, said Fabrizio Innocenzi, who, with his fiancee, Virginia Tacchia, owns about 60 sheep in the hills of Roviano, 40 miles east of Rome. Sheep “at first glance seem docile, simple, but they’re not. They’re very complicated and need lots of care and attention,” he told CNS. “They need a guide, a shepherd” because there is no natural leader or hierarchy within their group, he said. Their movements are dictated by what the others are doing around them, creating a kind of “domino effect” that can easily break into panic if just one sheep gets spooked, he said. The role of the shepherd and the sheep dog are essential then, he said, to keep the sheep calm and away from danger such as steep cliffs, roads, cars, wrong turns and predators. The sheep learn to trust the shepherd, Innocenzi said, as “they hear and understand the voice, the smell, the behavior of the person who is looking after them every day. The trust that develops is forged not out of fear, he said, but from the instinctual knowledge that the shepherd and the sheep dog are there not to punish, but to keep them safe. The shepherd’s staff, for example, “is not used for hitting,” she said. It provides the shepherd with the support he needs to clamber over rough and steep ground, and it lets the sheep, whose view is limited with their low hanging heads and eyes focused on grass to graze, know their guide is there as the staff rhythmically strikes the ground. “If I hear ‘thud, thud,’ it means that he is here. Maybe I don’t see him, but I hear him, his voice, his staff. In the Bible, it is not the eye, it’s the ear that’s fundamental. The sheep listen. The ear is the essential organ for knowing God,” she said. In Psalm 23, she said, “The Lord is my shepherd,” who fulfills every need, who leads, restores and guides, and whose “rod and staff comfort me” because they are used to conquer evil and not to abuse one’s own flock. The saving power of the pastoral staff is further evident with Moses, she said. Through God’s intercession, Moses uses his shepherding stick to part the Red Sea and lead his people to safety, as well as to split rocks in the desert so water gushes forth to quench people’s thirst. The humble shepherd’s stick “is turned into God’s presence, it performs miracles,” she said. The Catholic Church uses more than just a bishop’s crook or staff to communicate his role as shepherd. Archbishops receive a pallium, a narrow band made of wool with long strips hanging down the front and the back, tipped with black silk to recall the dark hooves of the sheep the archbishop is symbolically carrying over his shoulders. The pallium is meant “to restore, to actualize the symbol, to remember that it’s not about having another garment. No, you have to remember that pastoral ministry is carrying the flock on your shoulders,” she said. Sister Bosetti’s order, the Sisters of Jesus Good Shepherd, are also known as the “Pastorelle,” the little shepherdesses, to underline the importance of women religious in the pastoral mission of Christ. Women shepherds appear often in the Bible, she said; and encouraging their pastoral side isn’t about ordination to the priesthood, but about collaboration and complementarity. Taking care of God’s people “must not be reduced to the priesthood,” she said. “We need a prophetic pastoral ministry” made up all faithful modeling the Good Shepherd himself: encouraging, consoling and leading the way forward with hope.